We are happy to receive email from you (using the booking form below), though for urgent appointments it is preferable that you phone in to us so to request your preferred date and time so as not be disappointed. Walk-ins are welcome, Noosa Junction is full of lovely boutiques and cafes, and often you may only have a few minutes to browse before we can accommodate you. Parking is available in a number of areas of Noosa Junction, either behind us in the Cinema Carpark, or the large public carpark at the South End of the Junction (adjacent to roundabout). We fully understand that you may be holidaying in Noosa, or are looking for a new therapist, or even trying out the likes of a brazilian wax for the first time and are tentative, don't be concerned we are always happy to answer your questions fully so please do not hesitate to contact us. 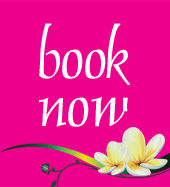 Services: Hands & Feet Therapy, Facial Therapy, Waxing (including Brazilian), Body Treatments, Tinting, Laser Therapy, Permanent Makeup, Spray Tanning.